Heung-Min Son scored a fantastic left-footed goal to give Spurs the lead in their match vs Arsenal in the League Cup quarter finals tonight. 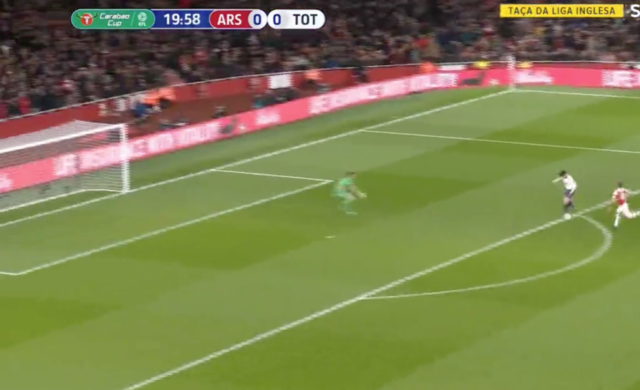 With the game at 0-0, a hoof from Paulo Gazzaniga was aimed towards Lucas Moura, with the ball falling to Christian Eriksen following a mistake from Arsenal’s Sokratis. The Dane then played a fine ball over the top for Son, who composed himself before slotting home emphatically with his weak foot to hand the away side the lead. It was a fine finish from Son, one that sees the South Korean keep up the impressive form he’s been in of late. Here’s a clip of Son’s great finish tonight. If that’s his weak foot, we can’t imagine what his strong foot’s like!